Orange Cupcakes are among one of the few goodies which I bake regularly. I saw this recipe a couple of years ago in a magazine. I was primarily attracted to this because it was egg less. I avoid the icing part since it tastes good even without it. For more kid- friendlier version. Even we elders love this. Banana & orange make a fabulous combination .Since their sweet and sour taste perfectly complement the orange juice used in the cakes. These are tasty and easy to make . Try to use freshly squeezed orange juice for the best flavor. You’ll need to have fresh oranges on hand for their zest . The cupcakes rose beautifully and had a great texture; soft, so fluffy and delicious! In a large bowl, sift together flour, sugar, baking powder and baking soda. In a medium bowl, smash banana whisk together orange juice, vegetable oil,/butter, vanilla and orange zest. Pour into dry ingredients and stir until just combined and no streaks of flour remain. Distribute batter evenly into prepared muffin cups. Bake for 15-18 minutes, until a tester inserted into the center comes out clean. Let cool for 5 minutes in the muffin pan and then remove them from the pan. And Please check out my New articles about Women' s day & Satt phere .your views and comments are welcome! Lovely colour...can guess the aroma while baking this delicious cupcakes..yummy!! Yummy yummy orange cupcakes. Your recipe is making me hungry. 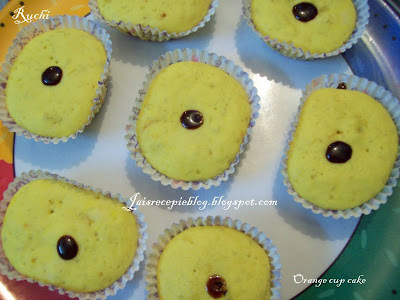 orange cup cakes ws really very yummy amma..! 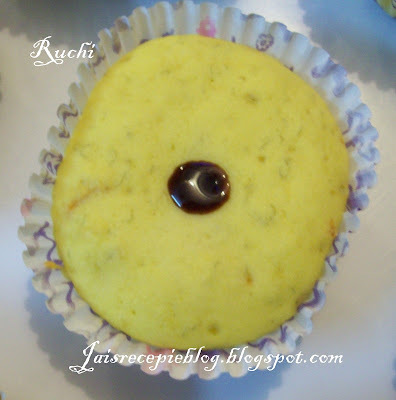 :)..
guys try this recipe at home...its awesome..! This is the recipe , I have been searching for a long time. Thanks for posting. Cakes look so yummy dear. I always love eggless cakes.. this looks awesome! nice click! your orange cake looks fabulous; i lovethe flavor of orange. and the addition of banana must give it real soft and fluffy texture! yummm, lovely color too and happy holi to you and to all at home! I can imagine how the cake had turned out by seeing it jaishree. Perfect.